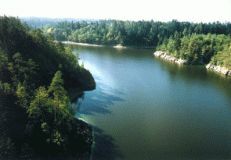 The Otava river is the third biggest South Bohemian river (after the Vltava and Lužnice rivers). 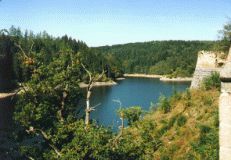 It is the left tributary of the Vltava river; they join below the Zvíkov castle at the beginning of the Orlík Dam. The Otava river originates in the confluence of the Křemelná and Vydra rivers near the small village Čeňkova Pila. 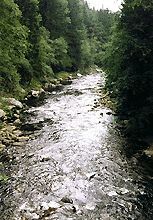 The headstream is the Vydra river, which springs as the Modravský Potok (Modrava Stream) about 1,200 m a.s.l. 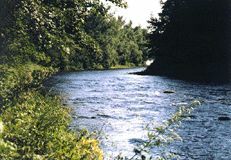 The Otava river runs from the beginning in the stony bed with rapids through the narrow valley. The first bigger tributary is the Losenice river, which empties into the Otava river from the left side near the small village Rejštejn. Then Otava flows to the town Sušice. Ahead of the town the river slows the stream down in the wide and open valley. 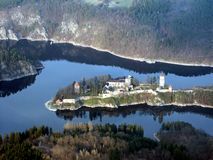 Then it runs around the large ruins of the Rabí castle and it heads to the towns Horažďovice and Strakonice. 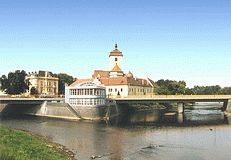 In Strakonice there is a confluence with the Volyňka river (from the left side) below the Strakonice castle. The Blanice river flows into Otava from the right side ahead of the town Písek. The stone bridge from the 13th century, one of the oldest bridges in Central Europe, spans the river in Písek. Then the Otava river runs through the deep and narrow valley to the confluence with the Vltava river. Ahead of the mouth the Lomnice river joins the Otava near the Zvíkov castle, at the beginning of the Orlík Dam. The Otava river is a favourite place for canoeing. It is navigable for small boats practically all the flow. The Otava is 133 km long (from the spring of the Modravský Potok) and its river basin is nearly 4,000 square km large. The banks of the river are partially marked with tourist sings. The red marked path leads along the part of the river between Čeňkova Pila and Sušice. The part between Sušice and Horažďovice is accessible along the green marked path, the part between Horažďovice and Písek along the red one. The red marked trails run along the river in parts between Písek and the small village Vráž and between confluence with the Lomnice river and mouth into the Vltava river as well.